August 11, 2008- This summer, you may have noticed a neat new feature on our web site. If you haven’t had a chance, check out the new ConnectEDU National Network™ interactive map. This new map provides you with a snapshot of our network growth at ConnectEDU. Thanks to a neat Google Maps application, this growth is illustrated through a fun and interactive timeline. With this new feature, we show you the location of each and every high school and college that is a part of the network. In just a quick glance at this map, you are able to observe our continued penetration into New England, the Midwest and Alabama, as well as growth in new states such as Texas, California, and Colorado. 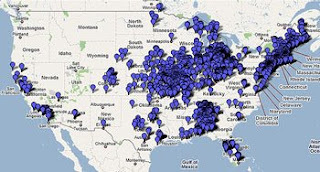 More importantly, this map illustrates our clear message to colleges from the time we launched the Connect! platform in 2002 - when college partners come on board and actively participate in the collaborative effort to bring high schools in their service area into the network – results are achieved. The visual relationship between high school aggregation and college partner location is clearly exemplified in the interactive map. We will continue to update the interactive map on a quarterly basis … stay tuned and watch as we continue to grow! For more information, check out the entire ConnectEDU National Network.